The aim of the Our Museum programme is to facilitate a process of development and organisational change within museums and galleries that are committed to active partnership with their communities. 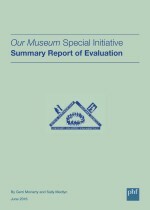 While the broader aim is to affect the museum sector as a whole, the initiative will work with a carefully chosen representative sample of up to 12 institutions: it will support and develop them to place community needs, values and active collaboration at the core of museum and gallery work; involve communities and individuals in decision-making processes; and ensure that museums and galleries play an effective role in developing community skills. The distinctive characteristic of the programme is a collaborative, reflective, learning process through which institutions and communities share their experiences and learn from each other as critical friends – recognising that they all have different starting points for the journeys this initiative will take them on.